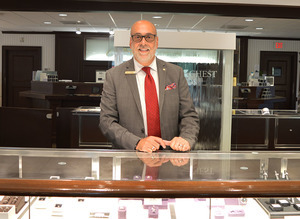 Michaels Jewelers at 132 Federal Road/Route 7 in Danbury, across from Stew Leonard’s, and a certified authorized PANDORA retail location, is delighted to announce the return of Joe DiFabbio, a resident of New Milford, as one of the store’s associates who specializes in luxury watches and timepieces and fine jewelry. Joe DiFabbio recently returned to Michaels Jewelers because he stated he wanted to ‘work with a family-owned business once again.” Mr. DiFabbio left his position with Michaels in 2012. Between 2012 and 2016 he worked with Tourneau and from 2016 to 2017 he was an assistant manager with Lux Bond in Westport. He was promoted to manager with the ambition of closing the company’s Greenwich store. While working with Tourneau between 2015 and 2017, Mr. DiFabbio received the Cartier ambassador position. Between 2017 and early 2018, he received certification training in Rolex, Cartier, Longines, and Breitling. In 2014, he also received certification in timepieces by the SIHH – Salon International de la Haute Horlogerie international trade association. He also took an instructive class on Tourbillon mechanically-enhanced and counter-gravity luxury watches given by Joanna Lange of A. Lange & Sohne. A resident of New Milford for the past 40 years with his bride Cathy of 34 years. His son Joe, married this April and teaches English at New Milford High school. Joe DiFabbio has been a member of the BMW club for 22 years and enjoys attending events with my 1992 5 series. With 10 stores across Connecticut, plus their PANDORA franchise locations, Michaels Jewelers is Connecticut’s leading retailer of diamonds and fine jewelry. This family-run business was founded in 1885 by Abraham L. Michaels and is managed today by fourth and fifth generation family members. In Connecticut, there are Michaels Jewelers stores in Danbury, Orange, Avon, Bristol, Torrington, and well-known malls including Westfarms, Manchester’s Buckland Hills, Westfield Trumbull, Westfield Meriden and Waterbury’s Brass Mill Center. In 2010, Michaels opened PANDORA retail stores in the Westfarms Mall, Danbury Mall, and Stamford Town Center, and currently offers PANDORA boutiques in 9 of their 10 fine jewelry locations. In 2012, Michaels expanded their PANDORA retail locations into New York, New Jersey, Arizona, and New Mexico in The Westchester, Paramus Park Mall, Menlo Park Mall, Willowbrook Mall, Coronado Center, Tucson Mall, and Park Place Mall. For more information on all the Michaels Jewelers nationwide, visit https://www.michaelsjewelers.com, and for information on the PANDORA concept stores in Connecticut, New York, New Jersey, New Mexico, and Arizona, visit www.lovepandora.net.